With clear and crisp sound, a multitude of features and gorgeously looking aesthetics, these tournament grade headsets are sure to give you a competitive edge. The Turtle Beach Ear Force XP Seven MLG Pro Circuit programmable surround sound console headset is the officially licensed headset for the MLG pro gaming circuit and comes at a premium price. But any doubts as to whether these are worth paying for are soon washed away as soon as you don them. Setting them up can be a bit challenging thanks to the myriad of customizable options but once you are up and running, they offer professional tournament grade sound which, truly offers a competitive edge for both tournament and casual gamers alike. 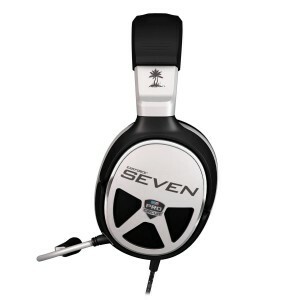 The Turtle Beach XP Seven has been specifically designed for the tournament scene though it has practical application in the home. 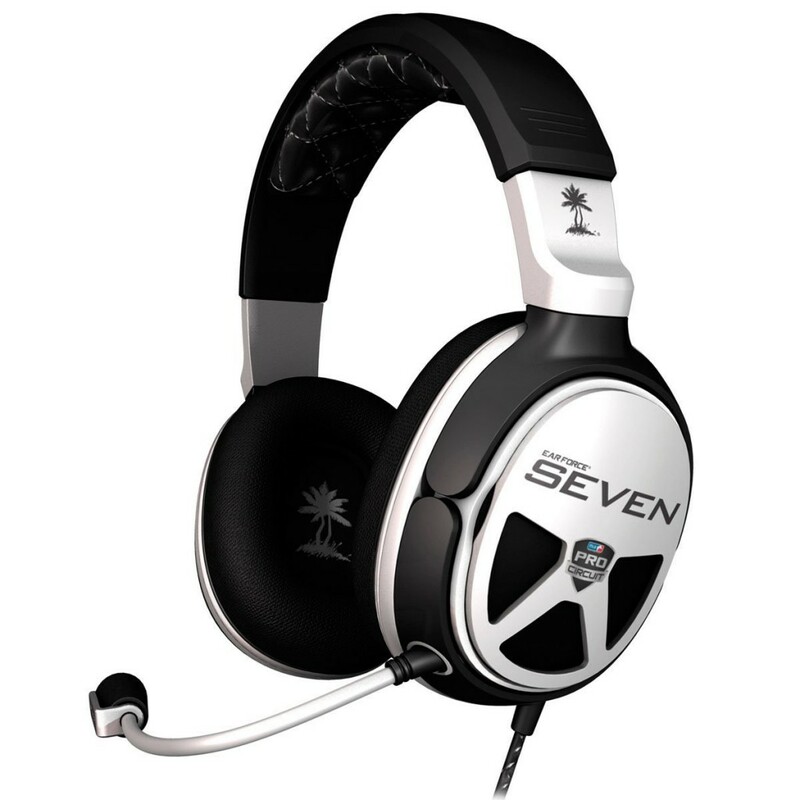 Turtle Beach is well renowned for producing quality gaming headsets through its Ear Force range for both the casual and professional gaming market but the XP Seven is arguably one step above the competition. 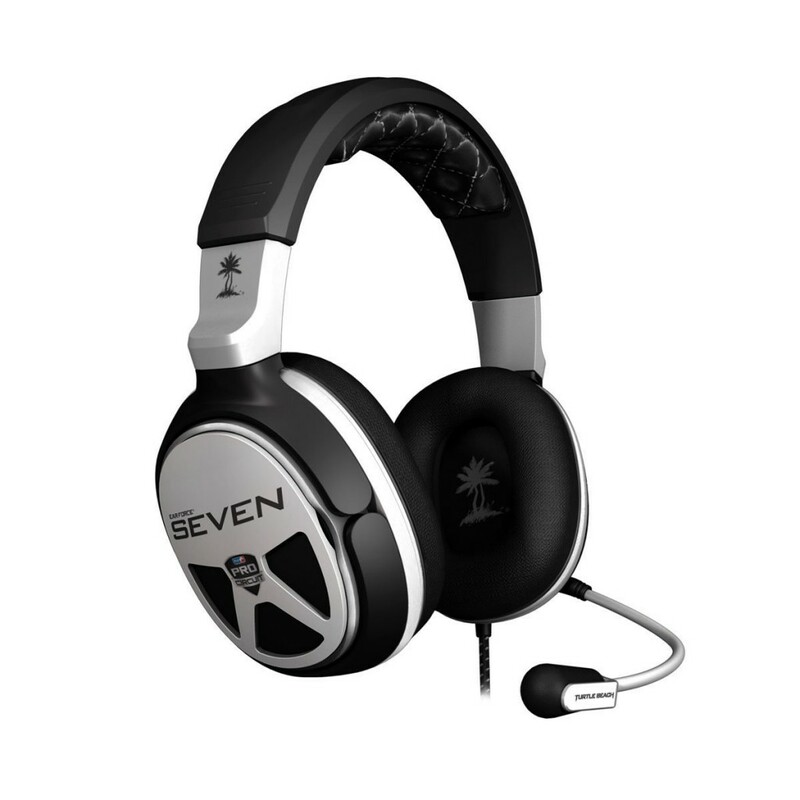 The XP Seven has a plainer look rather than the usual brighter more exotic color schemes adopted by other Turtle Beach or general headsets and in all honesty seems appropriate for its intended professional use. We definitely prefer the more serious tone this headset exhibits. The plain black and white with chrome splashes and white cross stitching comes together in a stylish slick manner. The headset itself is crafted with precision and you get the feel of a premium product in your hands. The headband is constructed solidly with a nice inside leather and cross stitch finish. The Turtle Beach logo is etched nicely along the soft matte surface on top. The foam ear pads on the interior of the ear cups are layered in soft leatherette and surround the black mesh which covers the headset’s 50mm drivers. The Headset comes with the SEVEN plates as standard which feature the nice Pro Circuit logo. They are replaceable for personal customization but we prefer the original SEVEN plates it comes with. The ear cups themselves are extremely versatile and can swivel vertically as well as rotate outwards to form a nice resting position comfortably around your shoulders when not in use. The cables feel solidly built along and around connection points and feel like they are built to last. The Turtle Beach Ear Force XO Seven are also compatible with the Xbox One (you will need the Xbox One Stereo Headset Adaptor) and PS4 which makes them relevant for the next generation of gaming too. Unfortunately the Turtle Beach Seven series is not a wireless headset (understandably as they are primarily used in tournament gaming theaters). We would therefore advise you strongly take this into consideration as your general casual gamer might be able to get away with a wireless headset for this price or even less – for example something like the Turtle Beach XP500, or more recently Elite 800 or Turtle Beach 500P or 500X models. If wireless (or a lack of it rather) is not too much of an issue for you, we would go on out on a limb and state that the XP Seven has a whole lot features that make it one of the front runners of headsets in its class. The 3.5 mm adapter cable allows the headset to be connected to any smartphone or your PS Vita. But to use the full raft of features the XP SEVEN offers, you must be connected to the console or computer via the Console Interface and the Audio Control Unit (ACU). The Console Interface connects to Consoles via the USB cable and to PC via 3.5mm adaptor. The ACU is your command center for the whole piece of kit controlling a multitude of features. It connects to the Console Interface via a long with dual USB and nine pin proprietary connectors. Using it is quite intuitive and it’s easy to adjust the 5.1 speaker volume and speaker angles as well as select the various EQ presets. You can monitor all of this through the LED display and Turtle Beaches Advanced Downloadable Sound editor will give you further options including fully programmable EQ presets. The result of all this is ultimately a highly customisable gameplay experience. There is an array of customization settings and options and it may take some time to get familiar with everything the XP Seven has to offer. One other slight negative is that the ACU capacitve buttons are a bit sensitive and you may find yourself inadvertently adjusting your volume or other settings. Fresh out of the box, the headset does feel a little tight on the head but this will ease up after couple of days of use. If your head is slightly on the larger side, you could place the headset around a large ball overnight so as to ease the tension. 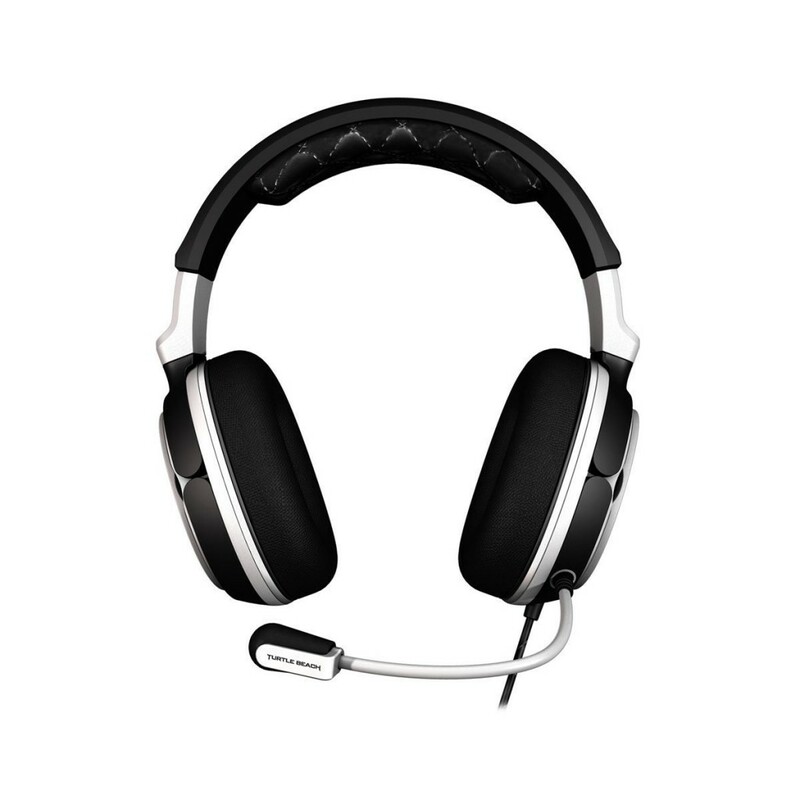 We would describe the headset as a firm and comfortable fit. 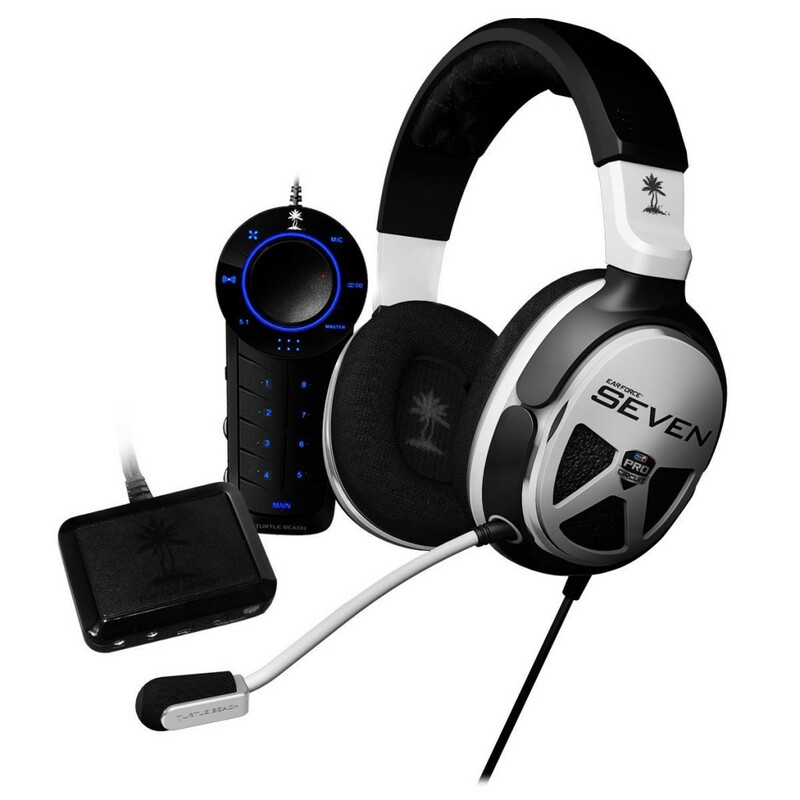 It is likely, as with any headset, prolonged use is going to cause some discomfort and the XP SEVEN is no exception here however the XP SEVEN holds up relatively well during those long sessions. We put the XP Seven through its paces with music, movies and gaming all of which exceeded our expectations. The sound source through 50 mm drivers and delivers high-quality audio. There is a notable lack of clarity in the treble but this is a minor complaint that can be remedied through the ACU’s customization options, to what is otherwise excellent sound output. The XP Seven’s produces deep and powerful bass. You can adjust the audio control units customisable options depending on your game type and environments so for e.g. in games like Battlefield 4 or Call of Duty, you can adjust the settings to get super human hearing for those quiet footsteps that so often result in a rear melee attack. The directional sounds that come out of the 50 mm drivers are accurate and are a crucial feature for hard-core competitive online gaming. Even away from online competitive gaming, games like Skyrim benefit from this immensely as you can hear the direction of the sounds (and therefore threats) as you venture through the world. Watching movies through this headset is a pleasure through Netflix as well as a Blu-ray both of which deliver fantastic sound. Music also plays well and is crystal clear without any background hissing or noise. As a high end Headset from Turtle Beach, the XP Seven does not fail to deliver. If you are in the market, there are very few substitutes that will compare and every serious gamer should give this headset some serious consideration if going wireless is not a big deal. Aside from gaming, casual gamers would be more than happy with this headset. Whether it’s for music movies all gaming, all three benefit from the XP Sevens multitude of features. If it is wireless you want, the Astro 50 or the Turtle Beach XP500 maybe more for you. Otherwise the XP sevens are truly an award-winning headset that any gamer would be pleased to have. In many ways we would say that this is reserved for the pro league tournament gamers however the edge that this gives you in competitive online multiplayer gaming, should appeal to any enthusiastic gamer. If you are in the market, check out the up to date cheapest prices here.